Season the salmon with salt, pepper, paprika and garlic. Cut the paper into four pieces, then dress with a little olive oil or butter. Place the salmon over the paper and then cover with the red onions, green onions (scallions), bell pepper, tomato, lemon, rosemary and dill. Close the paper over the ingredients to form an ‘envelope’ or small package, with the corners well sealed. This will prevent the juices from leaking out. Place the closed package over a baking sheet and cook for 20 minutes at 350°F. You can also add thinly-sliced potatoes, mushrooms, black olives, shrimp or seafood to the recipe as you prefer. The fresh dill can be substituted for basil or thyme. Salmon is one of my favorite types of fish. Whenever I can, I try to buy a fresh salmon filet to grill or broil at home. 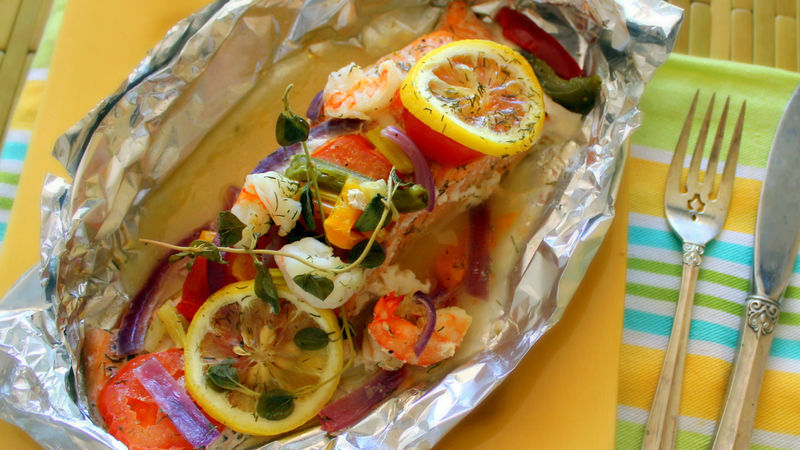 But this time I’m going to show you how to make baked salmon en papillote or with parchment paper. The papillote technique simply requires that all the ingredients be wrapped together in parchment paper or aluminum foil and cooked in medium-high heat. This method is an easy way to cook food; the ingredients cook in their own juices, better preserving their taste and aroma. This technique is recommended for fish, white meat or vegetables.